Dragontooth Crater is a dragon lair located due north of Karthwasten. A word wall here has a word for the Elemental Fury shout. Dragontooth Crater can be approached from the north and the west. Starting from Karthwasten, you must navigate east around the mountain and approach from the north. From the Shrine to Peryite, you must navigate west around the mountain and approach from the west. Before the dragons' return, the place is occupied by Forsworn led by a hagraven. There are three tents with two hay piles for sleeping, an arcane enchanter in front of the wall, a campfire in the middle of the camp, and a gruesome table with the remains of two people spread upon it between the fire and the enchanter. Around the camp there are up to four leveled Forsworn standing on lookout, warming themselves by the fire or sleeping, and a hagraven can be seen using the arcane enchanter in front of the wall. On the enchanter is a random soul gem, under it is a Forsworn headdress, behind it is a dead hunter, and the boss chest is against the wall. In the tower to the north there is a dead bandit, and on the table under the shrine there are two potions, a human heart, and a random dagger, all on the first floor. Also found is a leveled locked chest on the second floor and a random magicka potion on the top floor. After completing the Dragon Rising quest, along the path in front of the tower can be found a charred corpse and the corpse of an Imperial soldier. A dragon lies in front of the wall near some bloodstains, instead of resting upon it like most dragons. The wall still has a Forsworn shrine attached on it, and the boss chest still sits just inside the semicircle of the wall. The tower to the north has three floors. The first floor contains another burnt corpse in the doorway, a dead bandit on the floor, and a random potion of healing and a random dagger behind some rubble, by some bloody rags. The second floor contains a leveled locked chest, and the third floor has a random potion of magicka. In the rocks by the T-junction at the beginning of the path to the lair is an iron ore vein. There is a pool to the west containing an undressed corpse, with her clothes, a journal, a satchel and jewelry on the shore (see here for full details). The dragon located in this area sometimes has half of its body stuck in the ground. This may happen when you successfully sneak up and attack the dragon. It will try to face towards you and clip through the ground. In this state, the dragon will not attack or fly, and it cannot be killed. After depleting its health bar, entering an interior cell (with a loading screen) may trigger the dragon to register as dead. If you attack the dragon from the cliff above, it may fly above it and then use a swoop attack. It will be stuck in this animation and cannot be killed. 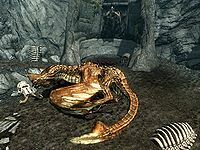 If you then fast travel to the location the dragon's corpse will be there and you will receive the dragon soul but it will never respawn, making quests that require it to be slain impossible to complete. Using Bend WillDB on it but not actually riding it can cause this as well. This page was last modified on 17 February 2019, at 13:06.